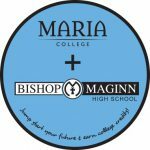 Bishop Maginn High School (Albany, NY) students have the opportunity for a “college-in-high school experience.” Two Maria College level courses will be offered per semester at the Bishop Maginn High School campus. Bishop Maginn faculty will teach each course under the supervision of Maria College faculty and Academic Dean. Eligibility for upper-class Bishop Maginn students to enroll in college level courses will be determined by Bishop Maginn teacher recommendation and with approval by the guidance counselor and principal. Any course prerequisites must also be met for enrollment. This is an extraordinary opportunity for students to earn college credits toward an associate’s degree in Liberal Arts at Maria College! Assuming successful completion of the four courses offered at Bishop Maginn during the high school junior and senior years, students will have earned 24-25 credits. A scenario of taking six credits following the summer of their Bishop Maginn graduation, only 30 credits will be needed to complete the AA degree which can be completed during the Fall (15 credits) and Spring (15 credits) at Maria College. A study of the principles of effective written communication with an emphasis on the practical writing needed for academic and professional work. The course concentrates on the development of writing in terms of focus, content, organization, style, and mechanics. Students will engage in writing and rewriting using instructor and student feedback. Summaries, short papers, quizzes and APA-style research papers are required. MAT 106 3 credits Note: this is a prerequisite to take pre-calculus next year. This course provides students with a firm foundation in college algebra through a systematic exploration and application of concepts. The course assumes a familiarity with foundational algebraic vocabulary, symbols and notation. Students will deepen their conceptual understanding of key algebraic ideas and develop advanced algebraic skills and strategies, while strengthening problem-solving abilities. Emphasis is placed on the modeling of real-world problems in order to apply college algebra principles and computations to real-world situations. Students will learn to think mathematically as they investigate the real number system; equations and inequalities; operations with polynomials; radicals and absolute value; linear, polynomial, quadratic, and rational equations; functions and their graphs; complex numbers; systems of equations and inequalities; and exponential and logarithmic functions. BIO 103 4 credits Note: this course is to be used as a prerequisite for Anatomy and Physiology and/or a health-related program; a grade of C or better is required. This course presents an overview of the structure and function of systems in the human body. The human organism will be reviewed at the chemical, cellular, tissue, organ and organ system level. Laboratory session and recitation hours are required. An introduction to psychology as a science: a study of cognitive, biological and social processes in understanding the dynamics of human behavior. Founded and sponsored by the Religious Sisters of Mercy, the private, co-ed college provides education for healthcare and service. Courses are offered in flexible formats; day, evening, and weekend classes. Academic majors include four and two year degrees and certificates. Many services are offered to support students’ personal, spiritual, and professional success. Administered by the Roman Catholic Diocese of Albany, the 9th grade to 12th grade high school welcomes students from all religious and ethnic backgrounds. College-prep, global learning opportunities in health care, government, and the arts are offered. Small classes allow individual attention to develop a student’s potential.